My husband loves stuffed mushrooms and we had some crab, so I thought I would put it to good use making crab stuffed mushrooms. These were delicious and the highlight of our New Year’s Eve dinner. I searched WordPress and found the recipe at the link attached. The only change I made was to use fresh crab rather than canned. It’s crab season and I live in the San Francisco Bay Area, so I wouldn’t dream of using canned crab unless forced to! These were easy to make and were delicious! They would be impressive to serve to dinner or party guests too! Watermelon – The Sweet and the Savory!!! Nothing tastes better on a hot summer day than ice cold watermelon! I recently got creative with this wonderful fruit and my friend Lisa insisted I post my recipes, so here we go! At our Father’s Day gathering I wanted to serve a creative appetizer, so I drizzled watermelon with a balsamic reduction and sprinkled it with some super creamy goat cheese. Yummm! You get the sweet of the watermelon with the savory of the balsamic and creaminess of the cheese. Those watermelons are so big that I always seem to end up with some leftover. For some reason it dawned on me to blend up my leftover melon with a little sugar to make a type of nectar that could be used to make a variety of drinks. It could be mixed with sparkling water for a nice refresher or with a little rum or vodka for cooling cocktail! I hope these recipes help to cool down your summer a bit!!! In a small saucepan, whisk together vinegar and sugar. Cook over medium heat until reduced by about half and syrupy. This will take about 5 minutes. After cooking, chill in refrigerator. Cut watermelon into square shaped bite size pieces. Round shapes don’t work as well for capturing the cheese in your bites. 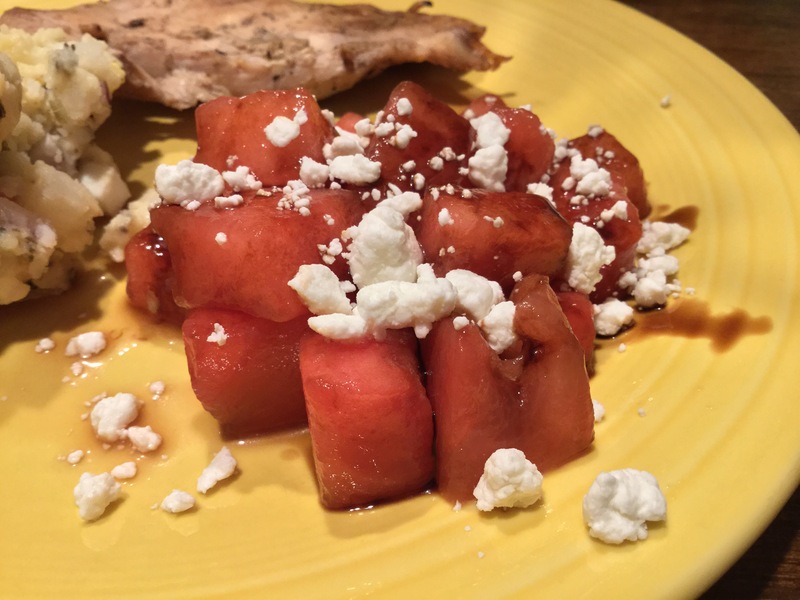 Arrange melon on a plate and drizzle with chilled balsamic reduction and then sprinkle with crumbled cheese. Serve and enjoy! You could use a blender or an immersion blender to combine your chunks of watermelon and sugar to make your necter. 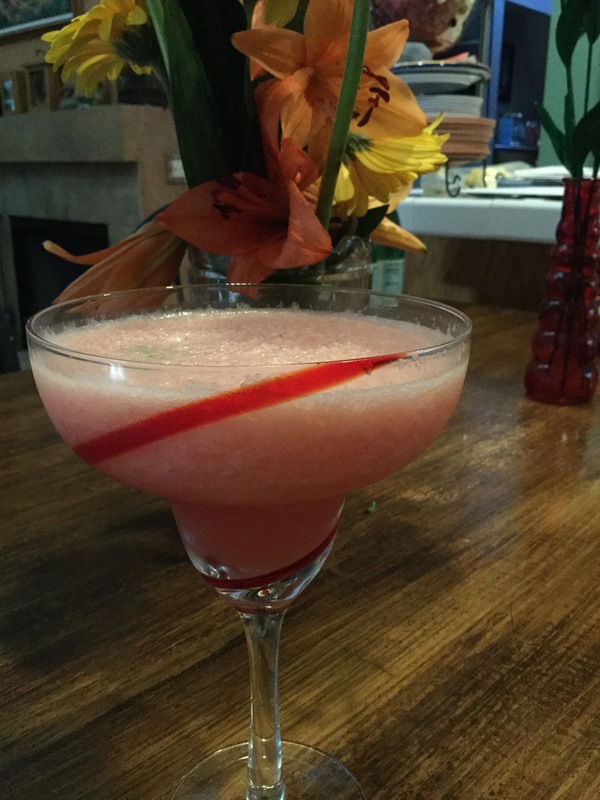 Watermelon Margarita – Blend necter, ice, margarita mix or lime juice and tequila. Watermelon Refresher – Mix necter, lime juice and sparkling water. Watermelon Mojito – Mix necter, lime juice, mottled mint and rum. 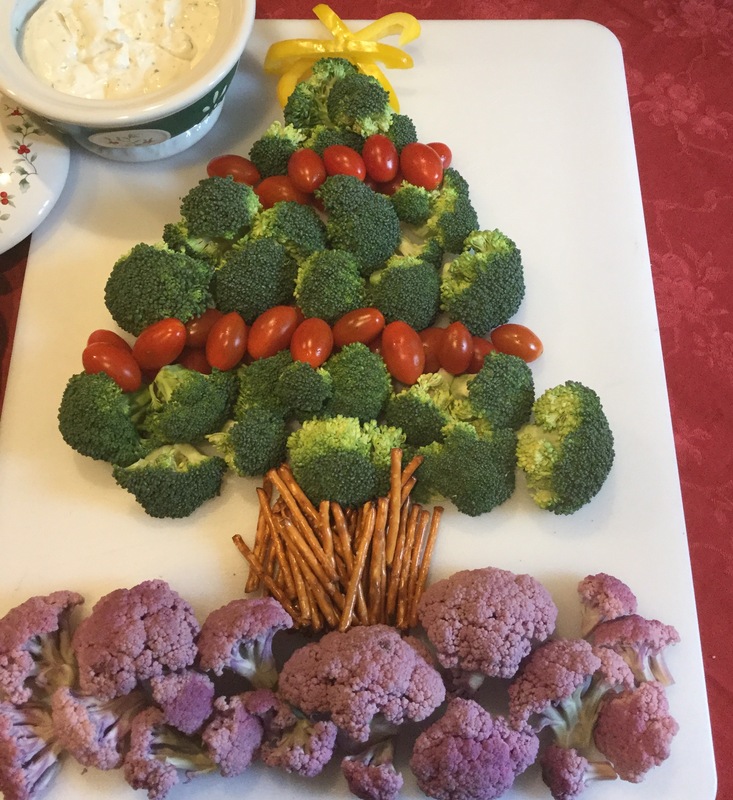 Who doesn’t put out a platter of fresh veggies and dip during the holidays? As the fancy people call it, a crudités platter! It’s a great light start to big family dinners! For our family Christmas dinner we decided to get artistic with it! I don’t know that the artistic impression made it taste better, but nonetheless, it was devoured and it sure looked festive! I do have to admit that I cannot take credit for the idea. I saw a picture floating around on Facebook several weeks ago and took a screen shot. I’m not sure where to give credit or I would! Anyway, it was fun and festive and took maybe 10 minutes to put together. I prepped the veggies yesterday and tossed them into individual bags in the fridge and then it took about 5 minutes before the family gathering to arrange. My grocery didn’t have any white cauliflower, so I grabbed the purple. I thought it would add a different color. Basically, as I like to say, play with your food! Play with the look! Play with the flavors! If things don’t work out, laugh it off and chock it up to a lesson learned! This was one I would do again though! I served my veggies with red pepper hummus and I made a simple yummy dip by mixing a packet of ranch dressing mix with a container of fat free sour cream. Everyone seemed to enjoy and we got some fresh, organic veggies into everyone! 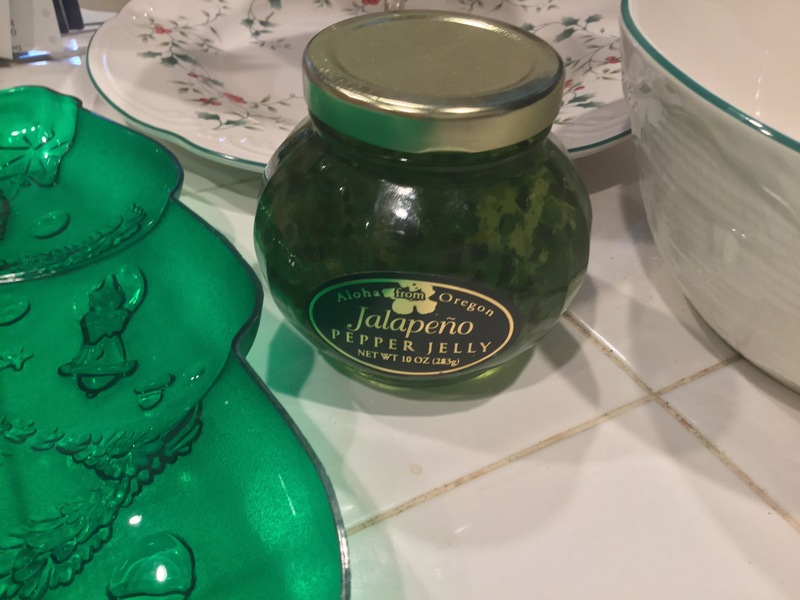 Pepper Jelly Over Cream Cheese – A Holiday Appetizer Favorite! So someone gifted you with or you bought some fancy pepper jelly while you were happy and free on a wine tasting adventure. Now what?!? Pour that wonderful spicy, sweet concoction over some cream cheese, grab yourself some crackers and now you’ve got something!!! I had never had this delicious combo until I was well into my adult years. I just hadn’t been exposed to this combination. Everyone in our family just loves it, so it has become a regular appetizer at holiday gatherings. The creamy-ness of the cream cheese and the sweet of the jelly cuts the heat of the peppers in such a way that even folks that avoid spicy foods will love this dish. The great thing is don’t even have to buy the expensive pepper jellys they sell at the wineries, but as you can see from my picture my husband is guilty of doing so. Our grocery stores here regularly carry a simple red pepper jelly that is also tasty and very festive looking. So just pour or spoon that jelly over a block of cream cheese. I like to use the reduced fat cream cheese. Put a little serving knife out so people can smear some spicy sweet cheese on their crackers and enjoy!